After a bank holiday away from the hobby, I went into Great Yarmouth this afternoon to see what I could find. As my Dart was pulling into the Market Gates Bus Station, I saw an Olympian ahead of me on the stand reserved for the Hemsby Beach - Great Yarmouth Town Centre service 3. It was First's 34333 (H132FLX) which is still giving sterling service. As it was parked in the gloom of the bus station, I moved outside to get a better picture of her in Regent Road. It is believed that she may be retired at the end of the month﻿ - that's tomorrow! Update: 34333 was noted working on town service 3 on 3rd September, so reports of its demise appear to be premature! From there I ventured to Beach Coach Station which revealed around twenty on site - may have something to do with the town's bowls festival, which finishes this week! 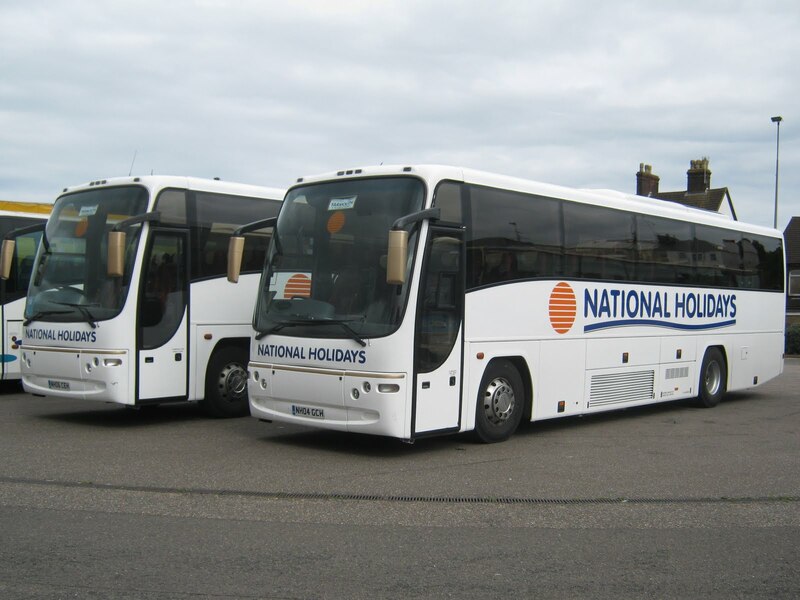 Together were two National Holidays' coaches NH06CEH and NH04GCH - both devoid of fleet numbers. 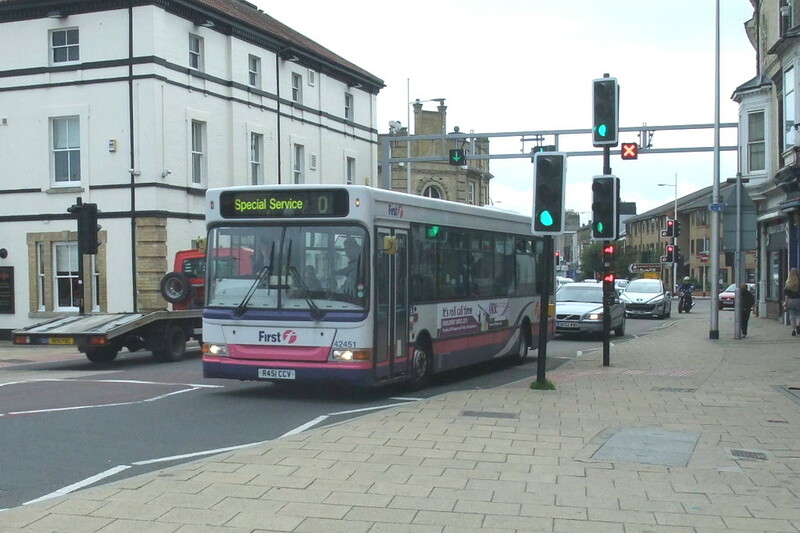 Just after 3pm, First Eastern Counties Gemini 37160 (AU07DXX) left Market Gates with a full load on the X1 to Peterborough with sister 37567 (AU58ECF) immediately taking her place on the stand; also Peterborough bound. It's unusual to have the two vehicles there at the same time - perhaps the first vehicle had experienced some delays. A little before 4 pm at least six vehicles were vying for space to pick up passengers in front of the Troll Cart Public House for their homeward journey. 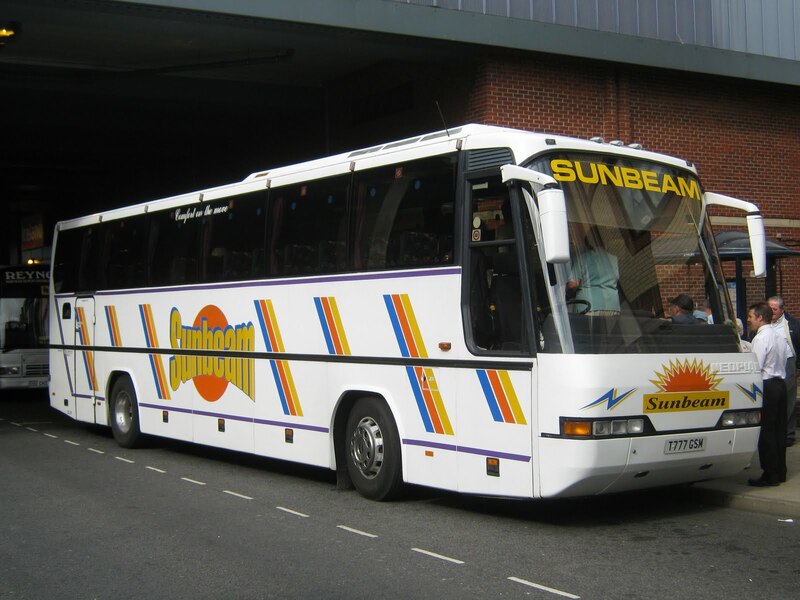 Colchester-based Kings Tours' KC08ABC beat Sunbeam of Norwich's T777TSM to the pole position with the two Belle Coaches (seen earlier) also in the line. 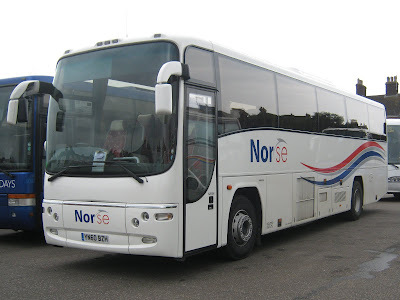 The other two unidentified coaches were from local operator Reynolds and another representative from Kings Tours. Two from Whippet - SF05XYZ on Coastal Service A and H19WCL on Coastal Service H.
Also former National Holidays Volvo B12M YC02CFO made an appearance and is now owned by Koncept Travel of Milton Keynes. It still retains some National Holidays logos! 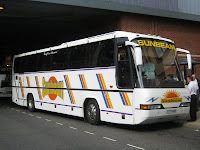 Another example from Nottingham City Coaches was also seen in Great Yarmouth during mid afternoon. YN07DZG was seen on Trafalgar Road returning its passengers to their hotel. Luckily, I managed to get a picture just before a car obscures the camera's view! Following the sighting of Newcastle Trolleybus LTN501 on the A17 at Long Sutton on Sunday afternoon, I contacted a member of the East Anglia Transport Museum to confirm the vehicle's destination. ﻿He confirmed that LTN501 had arrived at Carlton Colville on Sunday night. 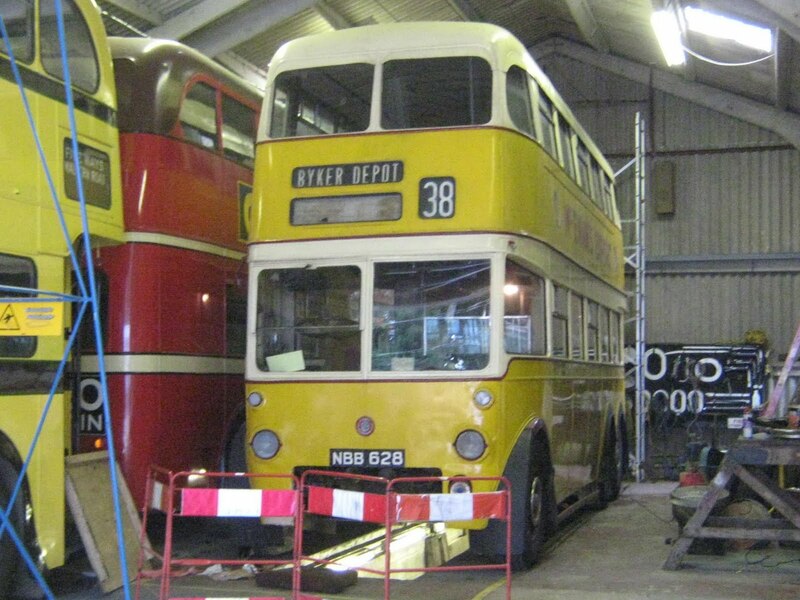 She will be the main attraction of the Trolleybus Gala on 10/11th September when operating alongside newly restored Newcastle Corporation BUT (Q1 type) No 628. It will be the first time since 1966 that the two surviving Newcastle Trolleybuses have been seen together. In recent months 628 has been undergoing a repaint and Syd Eade has sent in this picture of her in the early stages of repainting at the Carlton Colville museum. Another vehicle could also make an appearance at the event on the Saturday of the weekend, subject to an MOT, but its identity is being kept secret for the time being. Also on Sunday evening, Blackpool Corporation Marton Vambac Car 11 left under the cover of darkness for a brief holiday at Beamish to operate at their 'Power of the Past' event being held in early September. Grahame reports that Dart 43434 (P434NEX) went to Erith Commercials of Dartford in Kent for scrapping last week following withdrawl. 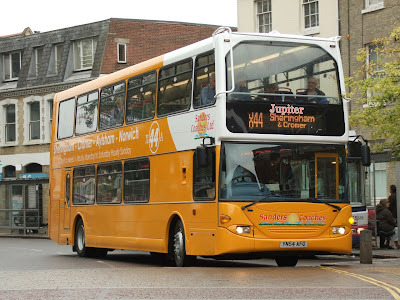 A second example 42445 (P445TCV) has moved south to First Essex. Regarding the Olympians reported at the rear of the depot in an earlier post, it appears that there are no plans to withdraw them at present. One Olympian under threat, however, is 34333 (H132FLX), which is expected to finish at the end of the month. 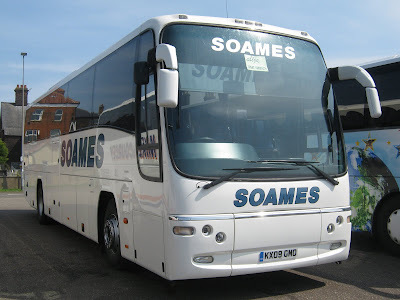 Readers may be aware the North Norfolk-based Sanders have recently acquired three new double-deckers ex-Reading Transport. My thanks to Grahame who photographed YN54AFO on Castle Meadow in Norwich on 14th August . 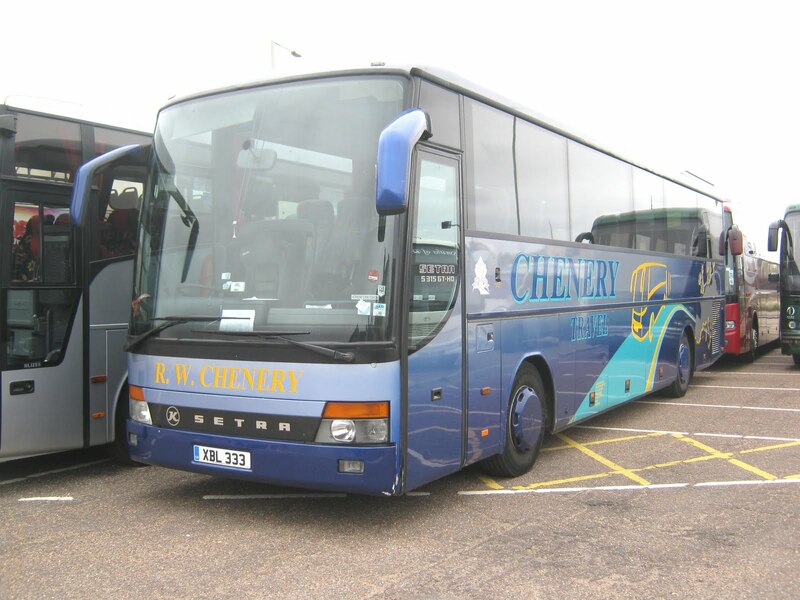 It is believed that these arrivals have led to Sanders selling their two Volvo B9TLs PL08YLXZ and PL08YMA to Ensignbus of Purfleet for further use. A **FREE** 2011 First Group fleetlist is exclusively available to East Norfolk Bus Blog readers. Syd Eade is able to provide this information which lists EVERY bus in the First Group which has held a five figure fleet number. 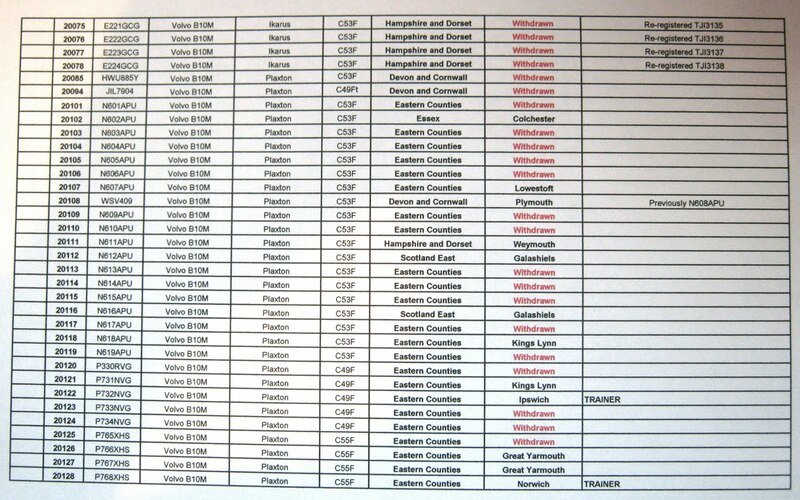 The list also includes the vehicle's current allocation - if it is still in service. There is also an alphabetical version which enables photographers etc to be able to locate fleet numbers of vehicles seen. Syd has been keeping the information up to date for his own use/interest which obviously quite a mammoth task. However, he thought it would be useful to others and is prepared to offer it to readers of this blog at no charge. Well worth having if you consider the current Fleet Book (retailing at £18) is months out of date! I obtained a 2010 version when it was offered through the Essex and East Anglian Yahoo Groups and have found it to be invaluable. A sample page is shown above and a clearer view can be seen when clicking on the image. How do you get a copy? All you have to do is to email Syd at cranks@lordraglan274.plus.com and he will email you a copy by return. Apologies to those who tried to get a copy earlier as I provided the wrong email address. All should be ok now and Syd is awaiting your emails! Regular readers of this blog will be aware that one of the three Routemasters acquired by First Eastern Counties, subsequently receiving Flying Banana Bus livery, has been repainted in 'London Red' and moved to the Essex area for use on private hire services. Regular correspondent Syd Eade was able to photograph NML623E at Chelmsford earlier this month in its new colours. She is also seen below in original form carrying a destination display for service 99 Lowestoft - Southwold. It was planned to operate it on the summer sunday service but the plan never materialised. 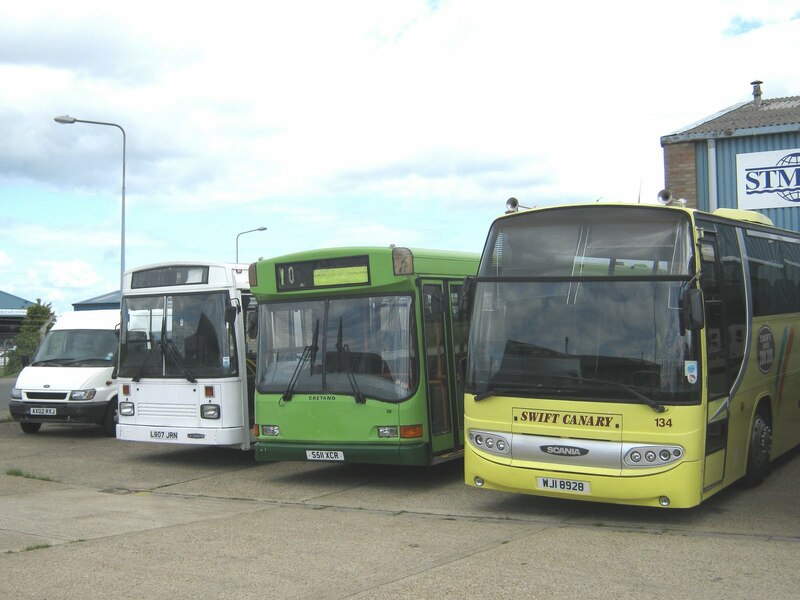 A few bits and pieces of news to report today on the Great Yarmouth bus scene. Meanwhile, at the rear of the depot this morning were three other Olympians. 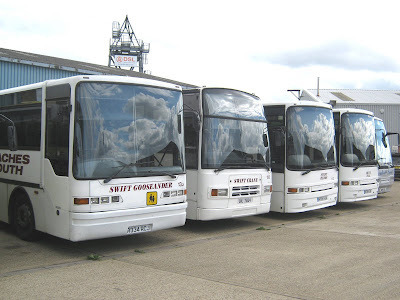 These were former Yorkshire Coastline vehicles which subsequently joined the First Eastern Counties fleet during 2009. They were 34108/12/3 (W435/2/3CWX) and are located where the withdrawn vehicles are normally kept. Their future appears bleak. 34113 is shown left at the rear of Caister Road depot this morning. 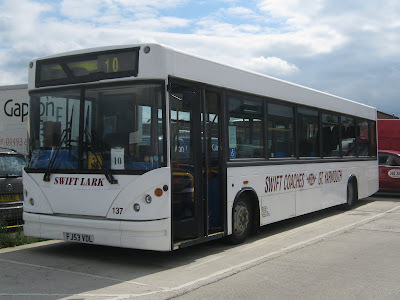 Swift's 500 Seafront Service was noted in operation today with the usual Mercedes Vario AE07NZC parked at the Britannia Pier bus stop. A visit to Copyfax Yard at Gapton Hall Industrial Estate saw only seven of the original line up of nine vehicles available for the recent auction. However, the two vehicles (Dart S511XCR and Volvo M734KJU) were later located at the nearby headquarters on Morton Peto Road. Brighton and Hove's Scania 502 was noted basking in the sun (and cloud!) at Beach Coach Station this afternoon. Bearing the registration HF08UHT, she was one of eight coaches on site. 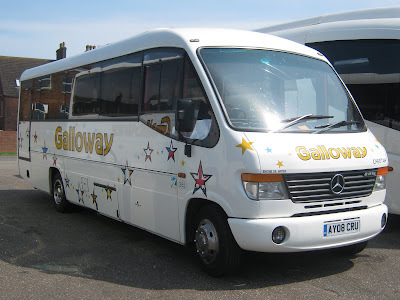 Meanwhile on the seafront, Our Bus Mercedes Vario SF54OUY was continuing to ply its trade on the Seafront Circular; whereas Swift's 500 service was conspicuous by its absence! The two First Essex Olympians, borrowed to provide cover for the Great Yarmouth's B7's used on the Lowestoft Airshow park and rides, have (or are to) return home soon. However, correspondent Syd Eade managed to capture one of them (34310) on Caister Road on service 3 between Hemsby Beach and Market Gates before it left. Note the use of the paper sticker 3 as there was no suitable destination to be found. He also caught 34310 on Sunday leaving Caister Road depot for her return ourney south displaying the unlikely destination of 'Stanford-le-Hope 200'! L310PWR is now at Chelmsford where she is to be used on the V Festival Shuttles next weekend. It is understood that she will later find employment on school work being based at Basildon. 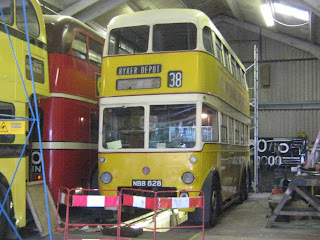 The other Olympian, 34311, is expected to travel south tomorrow morning also to Essex county town of Chelmsford. As always I am grateful to Syd for the information and photographs - the latter are his copyright. 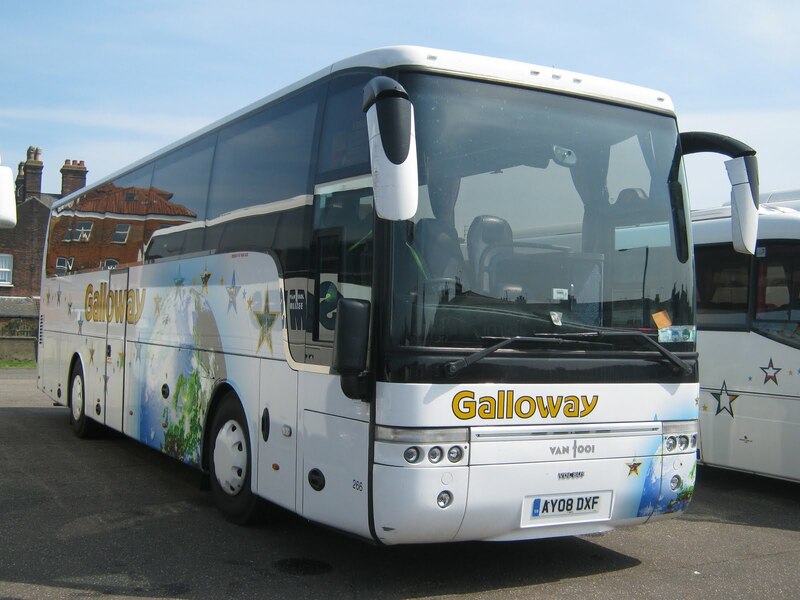 Stephen Gowler informs me that the coaches were parked at the railway station because they were working on rail replacement. The trains were apparently so busy because of the airshow that some stations stops were cut out with the coaches providing those services. At Belvedere Road Car Park there were seventeen vehicles on site and again Ipswich Buses Scania 61 (PJ54YZU) was in attendance as shown below. Correspondent Syd Eade saw Dart 42451 (R451CCV) on a teatime service to Dip Farm and kindly provides a photo of the working. She was the only SLF to appear on the A1 service. Syd also reported that the A2 from Kessingland was using Volvo B7TLs 32201/203/205/213/654 which managed to cope with the crowds without any need for extra vehicles. The last mentioned was a surprise substitution and is pictured by Syd here. Both Syd and I saw no sign of either of the two First Essex Olympians on services today, although it was later reported that they had seen use on service 3 in Great Yarmouth during the two days of the airshow. Finally, my thanks to Syd for providing the photos and reports for this year's Airshow Park and Ride workings. In addition to the Park and Ride workings undertaken by First Eastern Counties, the first day of the Airshow also attracted some visiting coaches/buses to local car parks close to the seafront area. With yesterday being the first day of the Lowestoft Airshow, the Park and Ride services were in use again with First providing the vehicles. 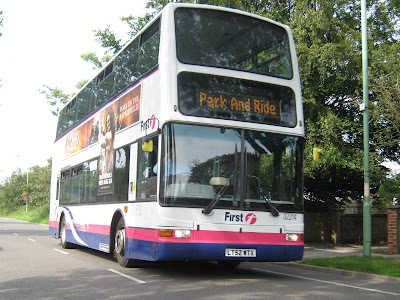 One service operated from the north of the town from Dip Farm to South Pier as A1, whilst the Kessingland Africa Alive to Rectory Road service operated as A2. With my grandchildren in tow, I was struggling to get something together for this report as my wife and I kept them entertained, fed and watered having arrived on the A1 from Dip Farm. I needn't have worried as correspondent Syd Eade rode in on his dashing white horse to provide an extensive report! Syd reports .. It was an all low floor affair with four buses on service A1 from Dip Farm using 32101/106/107/112 and six buses on the A2 from Kessingland utilising 32201/204/205/206/651/652. 32203 was a spare vehicle but it did operate one journey to Kessingland at 14.50 and returned light to work a teatime X2 to Norwich. 32211 also made a guest appearance on the Kessingland A2 service at 17.15, followed by 43465 at 17.30 to shift the crowds. My thanks to Syd for providing the report and exclusive photographs, for which I am eternally grateful. Syd, I hope I didn't overdo the fawning gratitude and trumpet fanfare! The title of this posting was so very nearly six out of ten! Why I hear you say? Well it was the number of Swift's vehicles parked in its Copyfax yard during the middle of this morning. All six of them feature in the online auction due to be held on the 12th August. Click here to view my earlier post containing the details of all ten vehicles. However, with no camera with me I vowed to revisit the site this afternoon. Lady luck was smiling on me as at 3 pm there were nine of the ten sited in the yard and hence the reason for the title of this post! The only vehicle missing was 132 Swift Wagtail (K264SSD) which was last seen parked at the rear of Swift's Southtown Road site. Later during this afternoon's shopping in the city, I had the opportunity to view activity in the Castle Meadow area. My first sighting was of Norfolk independent Neaves operating its DAF/Wright Endurance YJ03PRZ which was heading to the city's bus station on service 36. At around the same time, First's 66957 (WX55TZU) was seen on service 17 to South Tuckswood complete with its all over advert for Co-op supermarkets and food stores. 66957 is another former Great Yarmouth vehicle now based in Norwich. Norfolk Green vehicles also made appearances in Castle Meadow. This is Versa 504 John 'Red' Morgan (YJ10EYD) nearing the end of its X29 service from Fakenham. Sister vehicle 505 (YJ10EYC) was noted working in the opposite direction on the X29 some 15 minutes later. Towards the end of my time at Castle Meadow, I recorded First's Scania/Wright Solar 65674 (SN51UYH) on the 29 to Taverham. Quite a surprise, as I had this down as being a First Essex vehicle based in Colchester - maybe a loan or transfer? Here's the photo to prove it! Continuing the Saturday shopping in Norwich - time also allowed for some observations in St Stephens Street; one of the major shopping streets in the city. Firstly the new Geminis were very much in evidence on the 25's. Here 36176 (BD11CGE) passes Volvo B7RLE 69006 (AU05DMF) then awaiting its next duty. The latter was formerly a Great Yarmouth based vehicle. 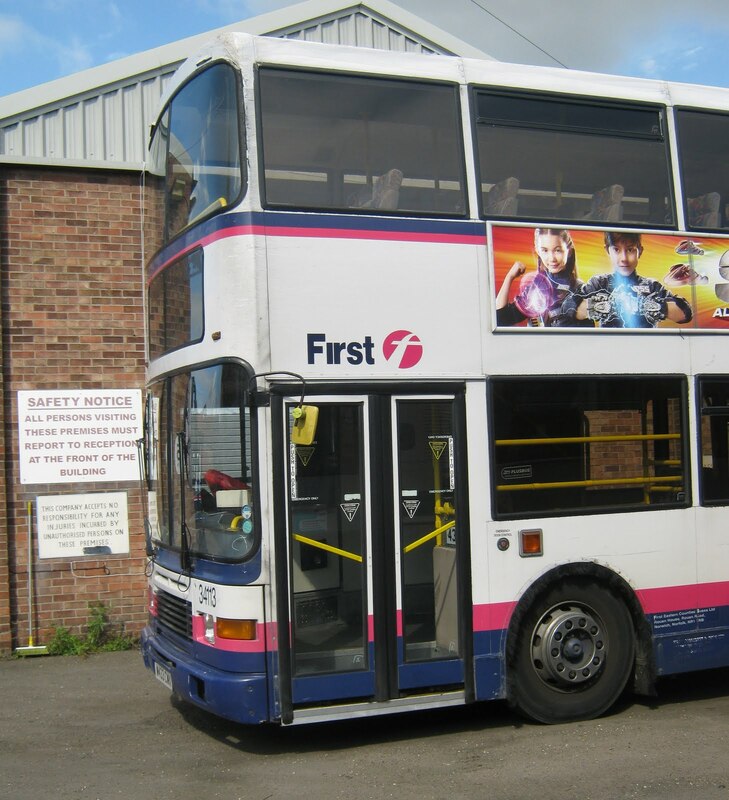 ﻿First Optare Solo 53120 (EO02NFA) also put in an appearance working the service 9 to Ives Road. Finally, First Trident 33238 (LT52WVG) was seen adorned in a livery promoting the forthcoming digital television switchover in November this year. Our Bus were not using their usual vehicle on the Great Yarmouth Seafront Circular this afternoon. In place of their Mercedes Vario SF54OUY was minibus HN05KJJ shown below. Swift was continuing to employ its Vario AE07NZC and both services seem to be carrying little or no passengers during mid afternoon. Ten Swift Buses For Sale at Auction! 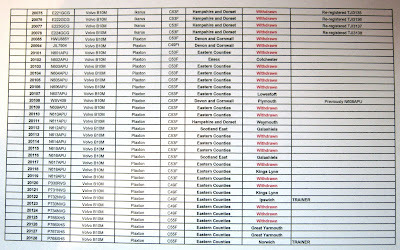 Swift Taxis has placed ten of its vehicles in a forthcoming online auction by Bedford-based W & H Peacock on the 12th August 2011. Pictures of all ten vehicles were available on the W & H Peacock website prior to the auction but have subsequently been removed. However, nine of the ten can be seen on a later post on this blog. Tuesday afternoon saw 17 occupants at Beach Coach Station in addition to a full car park - yes the holiday season is now in full swing! Amongst the total at 2.30 were two Suffolk independents providing three vehicles of interest. First up was Soames' Volvo B12 KX09GMO working for Alfa Travel. Unusually Stowmarket-based Galloway provided two visitors - VDL/Van Hool AY08DXF complete with fleetnumber 266. A smaller member of the fleet, Mercedes Vario 265 AY08CRU was the other vehicle. Regular visitors Shearings 217 BF10VCK and National Holidays NH05CDH were also there together with two Whippet coaches. Another couple of days in the West Midlands staying at Coleshill on the eastern edge of Birmingham. You may remember my previous blog report of my findings in the this location, if not you are welcome to view the page here. Again the two major operators from last time were present. 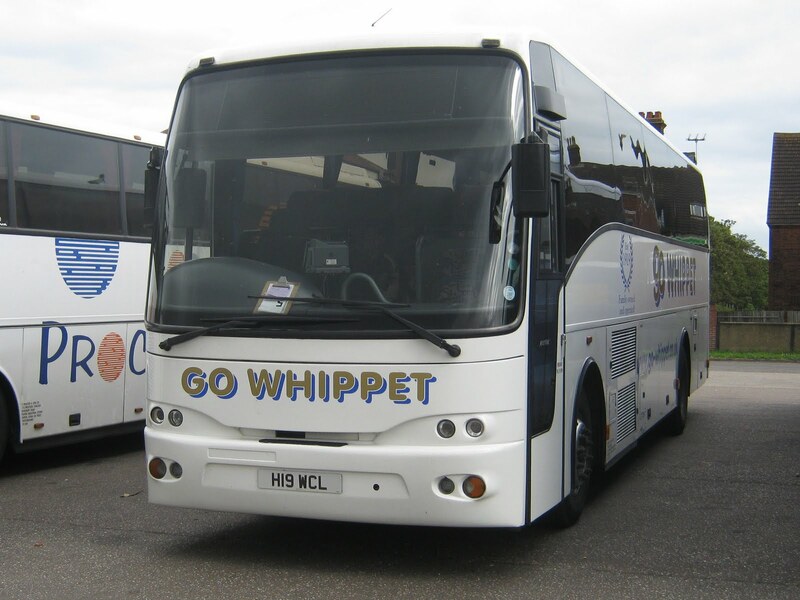 National Express West Midlands and Stagecoach Warwickshire. The former was represented by Trident 4187 (Y792TOH) seen crossing the River Cole below. Another couple of operators were also noted providing services in Coleshill. One of them was Arriva Midlands which was seen utilising Scania Omnilink 3800 YN08HZK on the 115 route. The many operators in different liveries added to the interesting bus scene in Coleshill.